Mike and his wife Michele (née Rowe) have two sons, Ryan and Michael. They live in Veradale, Washington. 1 2 3 4 5 "Years Can't Fill The Void". Sun Sentinel. June 19, 2004. Retrieved November 1, 2012. 1 2 3 Levesque, John (October 17, 2003). "Marlins' Redmond provides backup and backbone to the team". Seattle Post-Intelligencer. Retrieved November 1, 2012. ↑ "Gonzaga University Baseball Players Who Made It to the Major Leagues". Baseball-Almanac.com. Archived from the original on August 10, 2012. Retrieved August 10, 2012. 1 2 "Former Zag Mike Redmond Named Midwest League Manager of the Year – SWX Right Now-Sports for Spokane, CdA, Tri-Cities, Washington". Swxrightnow.com. September 1, 2011. Retrieved November 1, 2012. 1 2 Portland Sea Dogs (August 31, 2010). "Mike Redmond and Bill Troubh Enshrined into Portland Sea Dogs Hall of Fame". Milb.com. Retrieved November 1, 2012. ↑ "NewsBank for PBP | www.palmbeachpost.com". Nl.newsbank.com. May 14, 1999. Retrieved November 2, 2012. ↑ "Mike Redmond Statistics and History". Baseball-Reference.com. Retrieved November 3, 2012. ↑ Frisaro, Joe (November 2, 2012). "Redmond ready to turn preparation into action". MLB.com. Retrieved November 5, 2012. ↑ Boeck, Scott (November 1, 2012). "Marlins replace Ozzie with batting-cage nudist". The New York Times. Retrieved November 11, 2012. ↑ "Marlins introduce Mike Redmond". ESPN. Associated Press. November 2, 2012. Retrieved November 11, 2012. ↑ Frisaro, Joe (April 24, 2004). "Redmond injures left pinkie". MLB.com. Retrieved November 2, 2012. ↑ "Notes: Redmond sidelined for season". MLB.com. September 17, 2005. Retrieved November 2, 2012. 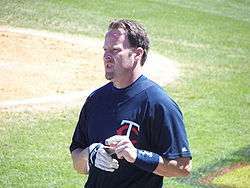 ↑ "Twins agree to terms with Mike Redmond on two-year extension". MLB.com. July 27, 2006. Retrieved November 2, 2012. 1 2 3 "Twins exercise option on Redmond". MLB.com. October 9, 2008. Retrieved November 2, 2012. ↑ "Redmond can walk, so he'll play". Star Tribune. August 29, 2007. Retrieved November 2, 2012. ↑ "Twins' Redmond hurts groin". ESPN. April 7, 2009. Retrieved November 2, 2012. ↑ "Redmond ejected for arguing, then Varitek goes too". USA Today. Associated Press. May 28, 2009. Retrieved November 2, 2012. ↑ Mason, Tyler (May 29, 2009). "Sox-Twins skippers, catchers tossed". MLB.com. Retrieved November 2, 2012. ↑ "Tribe inks Redmond to one-year deal". MLB.com. January 15, 2010. Retrieved November 1, 2012. ↑ Paul Hoynes (April 20, 2010). "Cleveland catcher Mike Redmond familiar with Minnesota Twins: Indians Chatter". cleveland.com. Retrieved November 1, 2012. ↑ "Redmond's errorless streak comes to end". MLB.com. May 23, 2010. Retrieved November 2, 2012. ↑ AncientMariner (November 7, 2010). "Indians Recall Gimenez, Designate Redmond For Assignment – SB Nation Cleveland". Cleveland.sbnation.com. Retrieved November 2, 2012. ↑ "Indians designate Redmond for assignment". ESPN. July 10, 2010. Retrieved November 2, 2012. ↑ Christensen, Joe (October 4, 2010). "Redmond's playing days are over but his baseball career is not". Star Tribune. Retrieved November 1, 2012. ↑ Larry Hook (October 27, 2011). "Lansing Lugnuts' brass unsure whether Mike Redmond will return as manager in 2012". MLive.com. Retrieved November 1, 2012. ↑ Larry Hook (January 28, 2012). 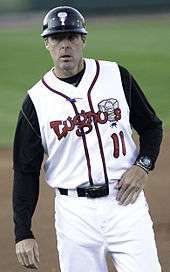 "Redmond leaves Lansing Lugnuts as most successful winning percentage manager". MLive.com. Retrieved November 1, 2012. ↑ Rodriguez, Juan C. "Miami Marlins to name Mike Redmond manager". South Florida Sun-Sentinel. Retrieved November 1, 2012. ↑ Fox Sports. "Miami Marlins give manager Mike Redmond extension through 2017". FOX Sports. Retrieved May 17, 2015. ↑ "Is Mike Redmond on the hot seat? – Fish Bytes". typepad.com. Retrieved May 17, 2015. ↑ "Marlins owner Loria endorses Mike Redmond: 'He's the manager. Period'". CBSSports.com. Retrieved May 17, 2015. ↑ "Manager Mike Redmond has been fired by the Miami Marlins". Washington Post. Associated Press. May 17, 2015. Retrieved May 17, 2015. ↑ Campbell, Dave (February 24, 2009). "Knuckleballer Dickey tries to catch on with Twins". USA Today. Retrieved November 2, 2012. ↑ "Career Leaders & Records for Fielding % as C". Baseball-Reference.com. Retrieved November 3, 2012.